The CAMRA SW London Pub of the Year 2009 (i.e. the current Pub of the Year throughout 2010) is the TRAFALGAR in Merton, which was also the winner of our Pub of the Year 2007 award and the Greater London Pub of the Year 2008. The winning pub was announced at the Battersea Beer Festival at 4pm on Thursday 11th February following a ballot of all CAMRA members in the SW London branch area - currently over 1,200. The official presentation of the award was at the Trafalgar on Tuesday 4 May 2010 at 8pm - see photos right and on Flickr.com [www.flickr.com/photos/flynnbar/sets/72157623872118951/]. A five minute walk from South Wimbledon Underground Station this is a small, traditional local pub dating from the 1860s and adorned with Nelson memorabilia. It’s a free house serving Pilgrim Thru’penny Hop Bitter (brewed exclusively for the pub) as well as four or five guest beers and Westons 1st Quality draught cider. Guest beers change constantly and are frequently from small breweries such as Dark Star (Hophead is a regular), Downton and Sharps with a mild often available. As usual the previous year’s winning pub was not entered for this year’s award. The Pub of the Year 2008 winner was the Bricklayer’s Arms in Putney. See the main Pubs page for other recent winners. 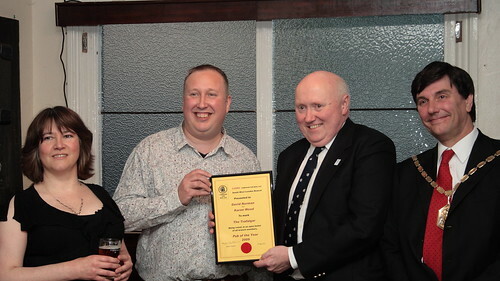 Karen Wood & David Norman of the Trafalgar, Martin Butler of CAMRA SW London, and Cllr Nick Draper, Mayor of Merton at the presentation of the CAMRA SW London Pub of the Year 2009 award on Tuesday 4 May 2010. There were seven pubs short-listed for the CAMRA SW London Pub of the Year 2009 award. They are all worth a visit. 1. Trafalgar, 23 High Path, Merton, SW19 2JY. 2. Nightingale, 97 Nightingale Lane, Balham SW12 8NX. 3. Eagle Ale House, 104 Chatham Road, Battersea SW11 6HG. 4. Falcon, 2 St Johns Hill, Battersea SW11 1RU. 5. Grapes, 39 Fairfield Street, Wandsworth SW18 1DX. 6. Hand in Hand, 6 Crooked Billet, SW19 4RQ. 7. Sultan, 78 Norman Road, South Wimbledon SW19 1BT. Please Note: If you print out this page then the map is not printed but a photo of the presentation is - Use File > Print Preview to see what the printout will look like. To print the map click the View Larger Map link and print directly from the Googlemap page. 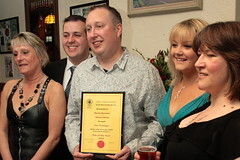 The presentation at the Trafalgar for Pub of the Year 2009 on Tuesday 4 May 2010. See more photos on Flickr.com. The VIPs at the announcement of the Trafalgar as Pub of the Year 2009 at the Battersea Beer Festival on Thursday 11 Feb 2010. The Hand in Hand was a family owned beer house for 100 years before Young’s bought it in 1974. Since renovated and enlarged internally, but without losing warmth and intimacy of atmosphere in the different drinking areas around the one bar. Martin Butler of CAMRA SW London, David Norman & Karen Wood of the Trafalgar and Cllrs Nick Draper, Mayor of Merton, Jane Cooper, Deputy Mayor of Wandsworth and Christopher Wellbelove, Mayor of Lambeth at the Battersea Beer Festival announcement of the CAMRA SW London Pub of the Year 2009 on Thursday 11 February 2010.